On her latest album, Lily Allen states that Creedence Clearwater Revival may very well be God's favourite band. When you listen to their best known track, 'I put a spell on you', you can just imagine Him playing airguitar. 'I put a spell on you' was actually a cover of a 1956 song written by Screamin' Jay Hawkins. 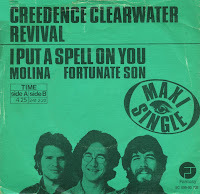 The Creedence version reached number 3 in the Dutch Top 40.